1-CD with 24-page booklet, 21 tracks. Playing time approx. 52 mns. Stereotyped by the outside world as three-chord wonders, country musicians are actually some of the most imaginative and technically adroit musicians in all American music. The blend of country instrumentation, jazz improvisation, and pop repertoire was never better illustrated than on the 1954 RCA 10-inch album "String Dustin" featuring Chet Atkins, Homer and Jethro and Jerry Byrd. It's rounded out here with additional titles, including a 1956 session with jazz guitarist George Barnes. Titles include gehören Stompin' At The Savoy, When It's Darkness On The Delta, Royal Garden Blues, Sweet Georgia Brown and Tennessee Rag. 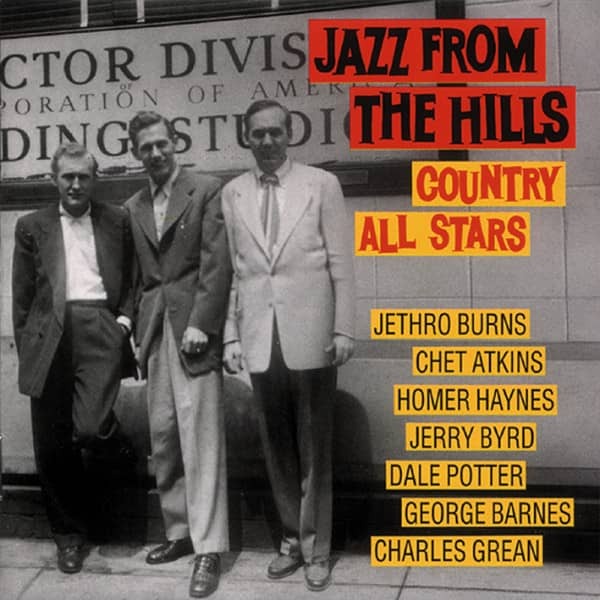 Mitglieder: Chet Atkins, Gitarre- Henry D. Haynes (Homer), Gitarre- Kenneth C. Burnes (Jethro), Mandoline- Bud Isaaks, Steel Guitar- Dale Potter, Fiddle Record Labels: RCA The Country All Stars, eine Studio Gruppe um den Gitarristen Chet Atkins, die Western Swing mit starkem Jazzakzent spielte. Customer evaluation for "Jazz From The Hills"